Roland Antoine Reid was born in Montreal on 30 November 1920. He attended high school at Le Collége Sainte-Marie before enrolling at l’Université de Montréal in 1936. 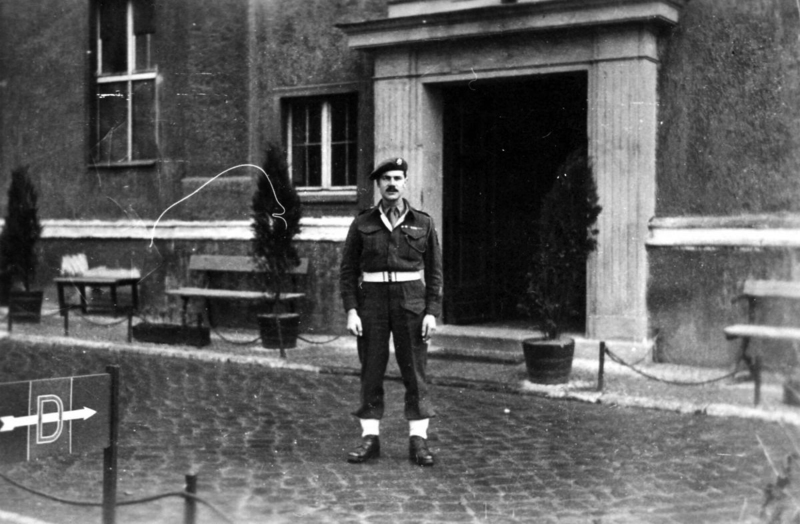 Roland put on his first military uniform as a cadet with the Corps école d’élèves officiers, a French version of the Canadian Officer Training Corps. He graduated with a Bachelor of Arts degree in 1940. Roland began an engineering degree at McGill University but left to enlist in the Canadian Army. He joined Le Régiment de Maisonneuve in 1942 but volunteered to transfer to the British Army in 1943. Captain Reid joined 2nd Battalion, The Devonshire Regiment in the Battle of Normandy towards the end of June 1944. On 11 August, as the Falaise Pocket began to form, Captain Reid led “D” Company in an assault on Rousseville. His platoons became separated due to the terrain and heavy German fire. Through his dash and initiative, Reid supervised the capture of the village. He then reformed the company and led it to its objective beyond Rousseville. This action earned Roland the Military Cross. Wounded twice, he served with the British Army until the end of the war. After the war, Roland continued his army career with le Royal 22ᵉ Régiment, serving in the Korean War. He held a variety of staff and command positions in the 1960s and 1970s, including chief coordinator for the 1976 Summer Olympics in Montreal. Major-General Reid retired from the army in 1977. Roland began a new career holding executive positions in nonprofits and the defence industry. 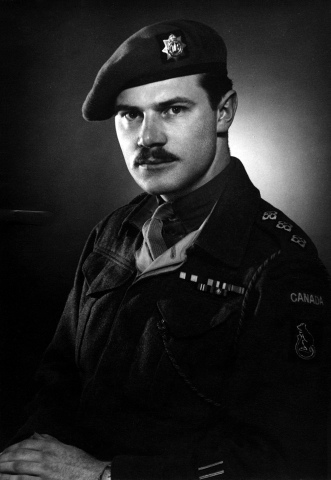 He held Honourary Lieutenant Colonel and Honourary Colonel positions with the Canadian Grenadier Guards and le Royal 22ᵉ Régiment respectively. Roland Reid died on 20 May 2015, aged 94. He was predeceased by his two wives, Rita Dansereau and Claire Brault, and left behind three children and one granddaughter. Not all Canadian soldiers served in Canadian Army units during the Battle of Normandy and the liberation of Europe. 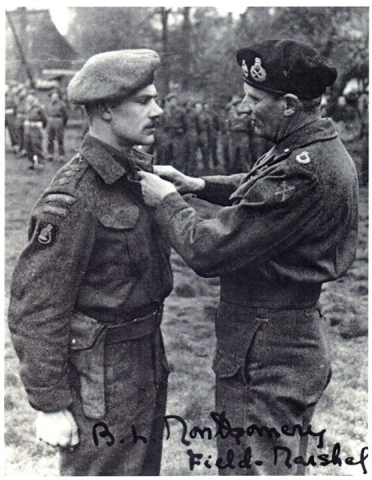 In January 1944 the Canadian Army approved a program to supply junior officers to the British Army, which was experiencing a shortage of lieutenants and captains. The call for volunteers went out, and 673 Canadians responded, including Roland Reid. Like Captain Reid 623 of these were infantry officers, while the remaining 50 were from the Royal Canadian Ordnance Corps. The Canloan officers suffered 465 casualties in 1944 and 1945, 128 of which were fatal. Of this figure, a staggering 75 (or 59 percent) died in Normandy during less than three months of fighting. This indicates the danger posed to infantry officers, who were instructed to lead from the front. They were often exposed while directing their men during attacks and targeted by German soldiers hoping to disrupt their enemy’s leadership. Officers in Normandy quickly learned to cover up their rank insignia and lose their ties and other items that would give them away as leaders. 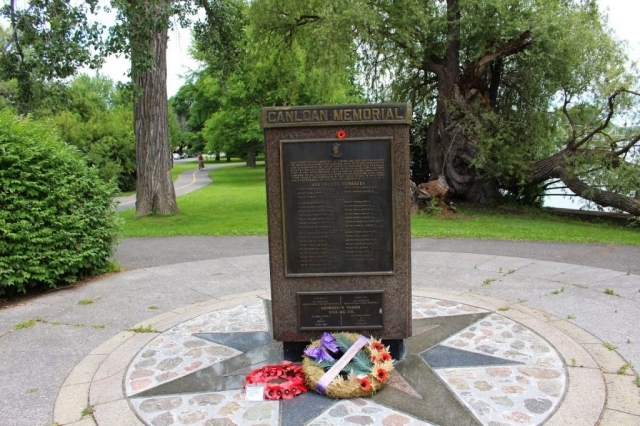 Although its roots were with the British Army, the Canadian Army had different cultural norms. In the British Army officers were instructed to avoid building relationships with their men. In contrast, Canadian officers generally took a more personal approach to leadership. 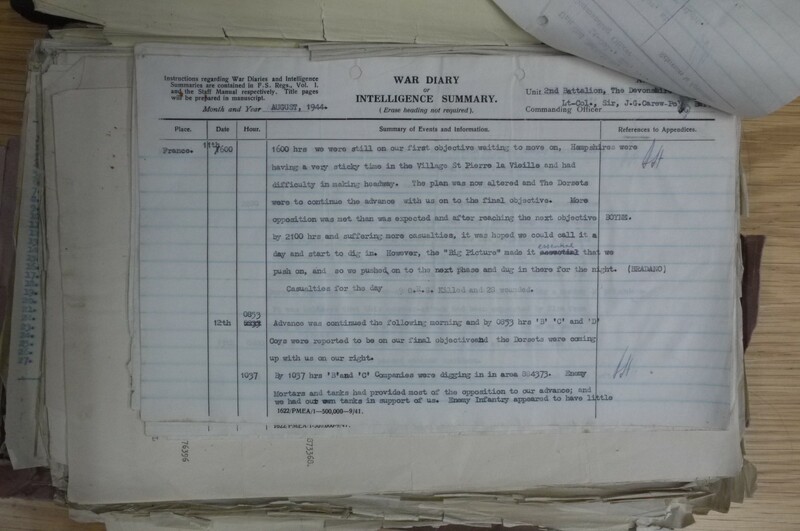 Canloan officers brought this approach to their units. 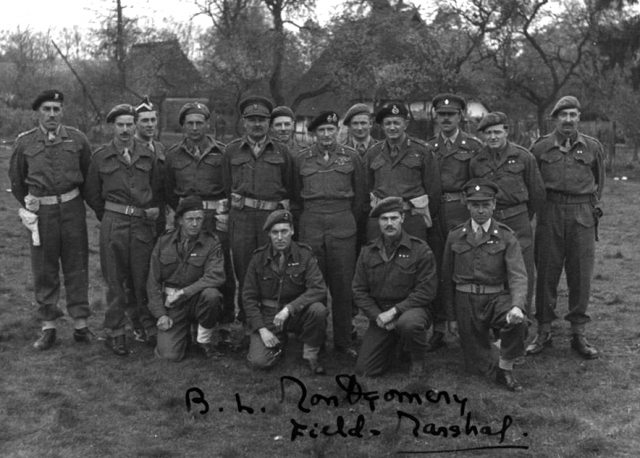 Captain Roland Reid earned his Military Cross just before the Battle of the Falaise Pocket. This phase (12-21 August 1944) of the Battle of Normandy took place after the Germans launched an offensive towards Avranches in the American sector. 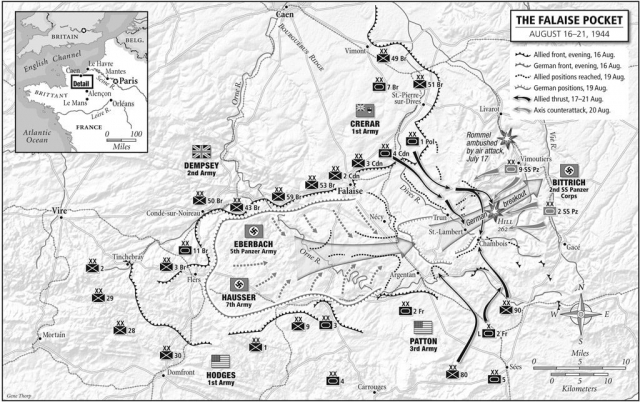 The German attack failed, and American and French troops began to encircle the Germans (in a pocket) from the southwest. The Germans, realizing they could be trapped, began retreating east between the Allied armies. 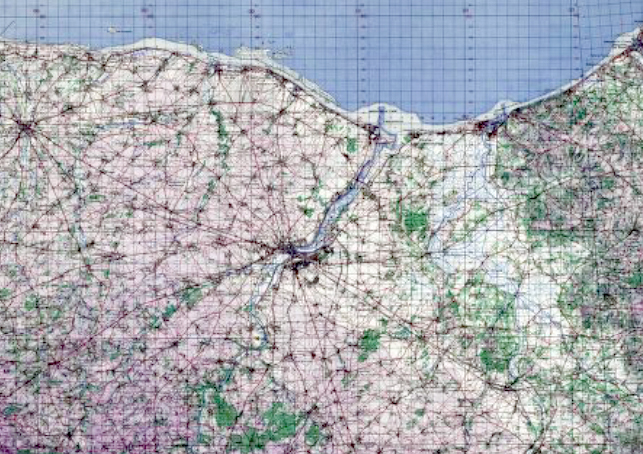 Their escape routes became known as the Falaise Gap. Canadian, Polish, and British troops fought towards and beyond the town of Falaise to meet up with the French and Americans to close the gap. Captain Reid’s 50th (Northumberland) Infantry Division operated on the northern and western parts of the pocket. The Falaise Pocket, August 16-21, 1944. Roland Reid’s battalion served with 50th British Division, located on the map just below the British flag. Tank crews at rest, making repairs; aerial reconnaissance takes off; aerial views of fields, a town in ruins; briefings in the field; armoured vehicles readied and roll out on the Falaise Highway; Canadians cut the German escape route; artillery fire; German prisoners from the 89th Division start to pour in; an American Liberator plane crashes in an open field with its crew parachuting to safety; other planes fly over; Typhoon bombers flying by; prisoners; infantry attempt to get by snipers in the town; tanks firing into a town; street fighting; ruins; injured man has his wounds dressed; the Falaise Pocket is taken by the Allies. Canadian troops captured Falaise on August 18, 1944.